While you get the other ingredients ready, drain the tofu and then weigh it down by placing a paper towel on top and putting something heavy, like a book on top. Place the olive oil, garlic, carrots, onion, mushrooms, and broccoli in a large stockpot. Sauté for a few minutes until the vegetables are mostly cooked through. Then add the vegetable broth and coconut milk. If you want your curry thicker, do not add the watery leftovers at the bottom of the coconut milk can. Add soy sauce, spices, lemon/lime juices, chili sauces, and vegetable bouillon cube as you bring it to a boil. After the tofu has been weighed down for at least a half hour, slice it into cubes and add to the stockpot. Add half the cashews and reserve the rest for garnishing. Let everything simmer together and make sure curry is to your taste, especially depending on how salty the vegetable broth you use is. Serve over brown rice. 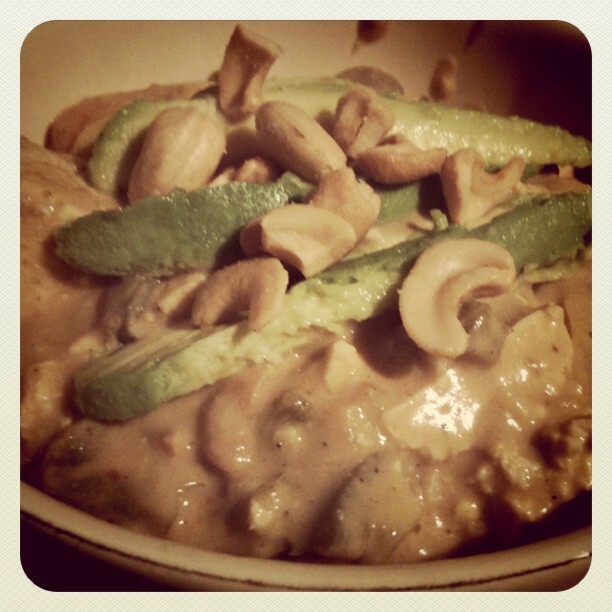 Garnish with avocado slices, and the remaining cashews. The more design work I have, the more I want to use my time to bake and cook. Going to the grocery store is the same as a kid’s excitement at a water park. It’s a fun way to spend the free time I don’t have. 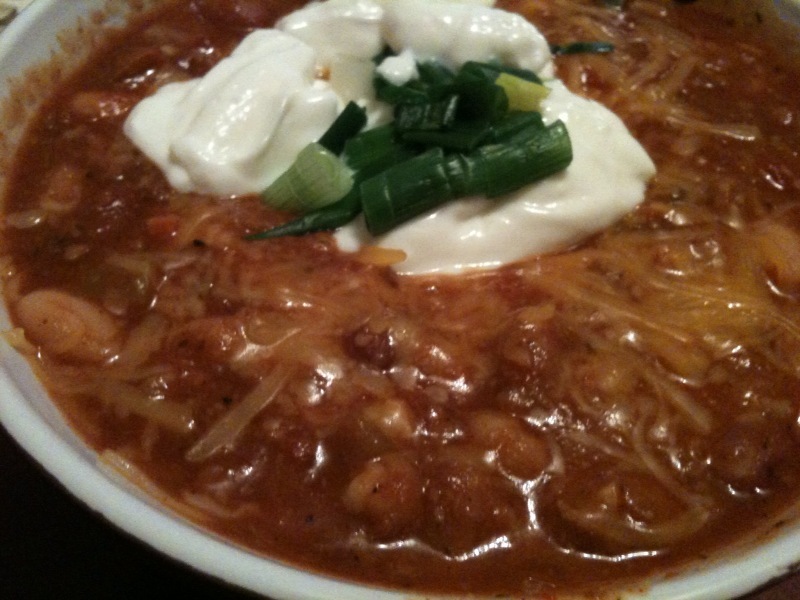 I’ve been wanting to make chili, even though it’s not cold out. Here’s a recipe for a HUGE batch. Can feed 8-10 people. Start by putting your minced pepper, onion, garlic and celery in the bottom of your stockpot and sautéing them first with butter or oil(such as grapeseed oil). After a few minutes, depending on whether you like thick or thin chili, add all the cans of beans to a large stockpot with or without their liquids. I usually drain them a little, but not entirely. Next play with the spices. I prefer to make my mixture from scratch, however if you want to skip this step there are many chili-packets you can buy to cheat. 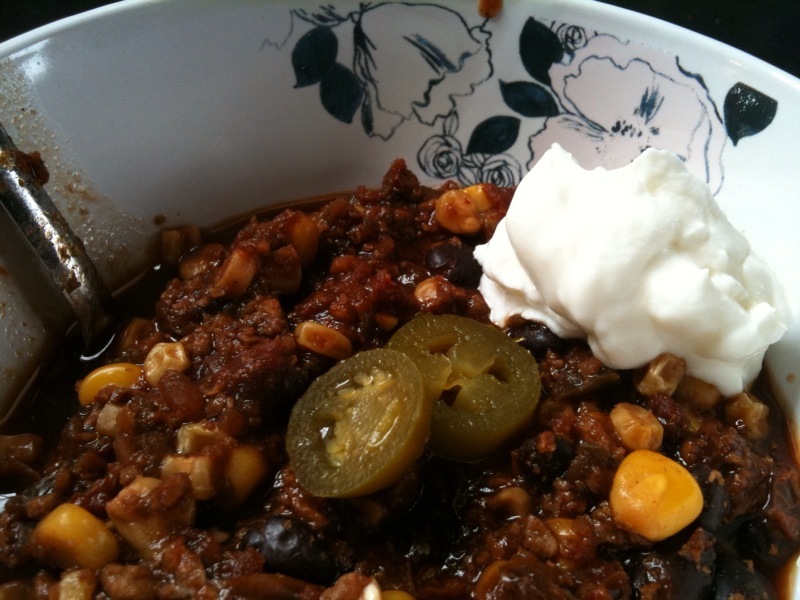 Bring the chili to a boil, but then let it simmer for about an hour. 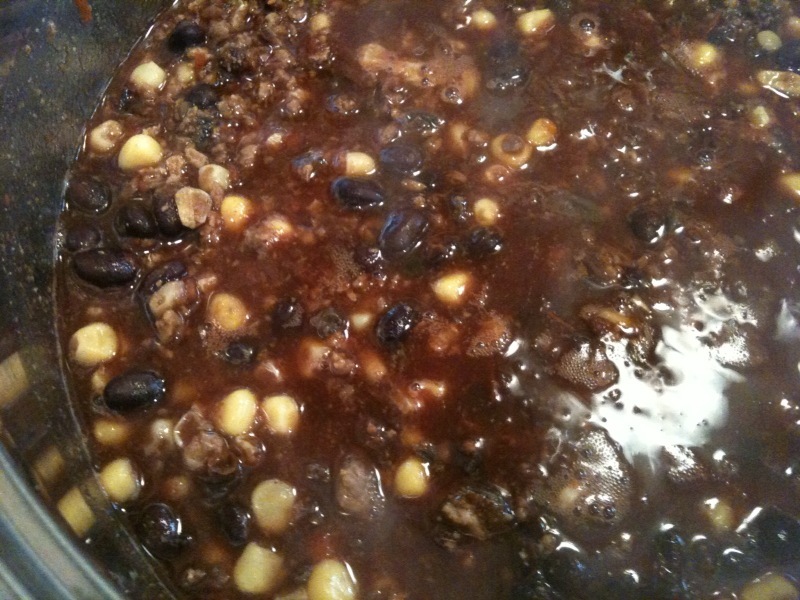 If you are choosing to add beer to your chili wait until the end, at about 45 minutes into the simmering. Instead of making waffles when I woke up [this] Sunday morning, I made tortilla soup for breakfast. No matter how hard I try, salty foods always win over sugar. This is one of those easy meals where you can throw a whole bunch of canned foods into a stock pot, simmer according to your schedule, and eat instantly or save for later. This also reveals my recurring weakness for Mexican food. Mexican for breakfast? Still tasty, right? <Throw all ingredients in a stockpot, bringing to a boil. Let simmer with lid for around 30 minutes. > When you actually eat this soup, there of tons of fun ways to enjoy it. You can use cheese or sour cream (or of course vegan versions of both), top with green onions or jalepenos, dip with tortilla chips, or like the title suggests, throw in torn pieces of tortillas. 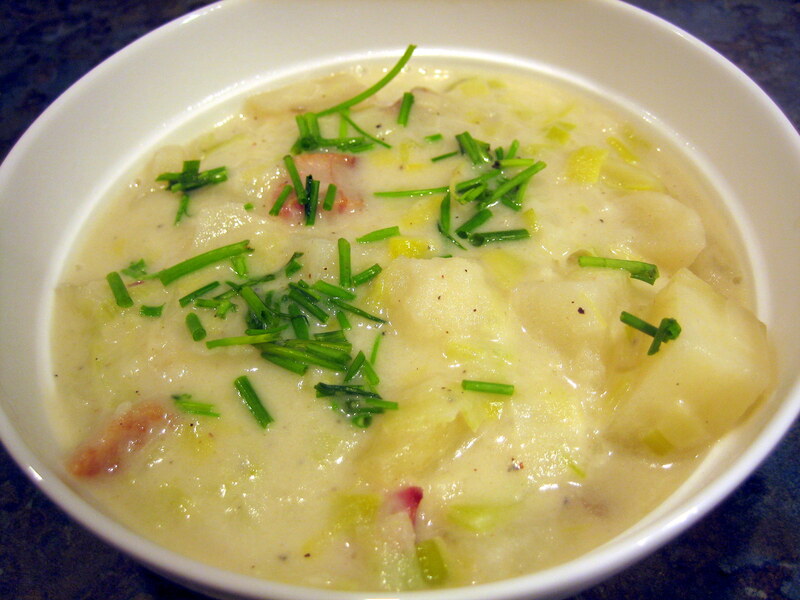 After browsing allrecipes.com, and all my cookbooks, most recipes for potato leek soup have 4 or 5 ingredients. As usual, I like everything I make to have more, more, more. 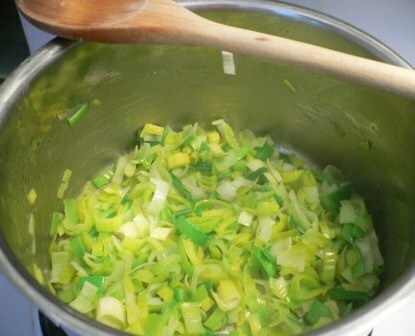 With little guidance, this is what I did to make some leek soup. dash black pepper, white pepper, and salt. Even smaller dashes of mustard seed and celery seed. 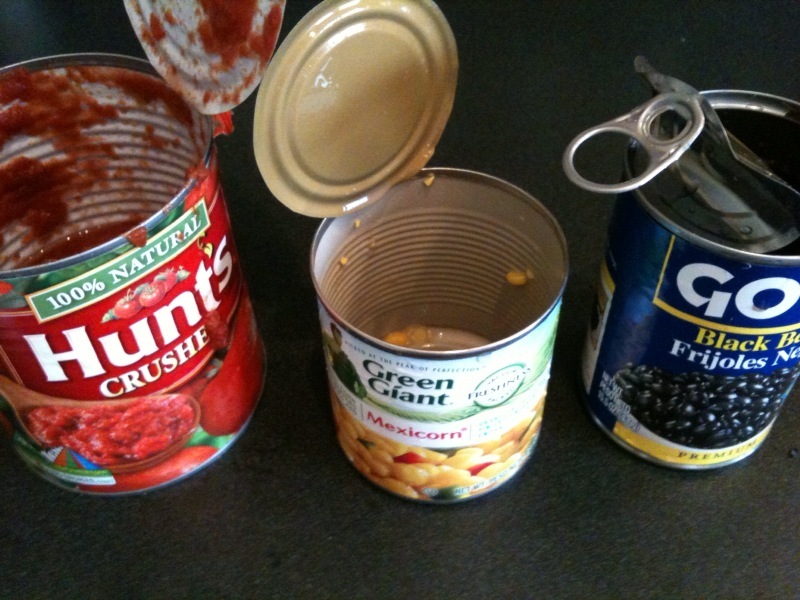 Saute these together, and then pulse in a blender about ten times until desired consistency as soup thickener. I hate to say it, but butter will make it taste better. Set mix aside. Cook potatoes first in microwave or by traditionally boiling them or steaming them. Add half of the cubed potatoes and leeks to the the liquids in a large stockpot with the bay leaves. Add above pulsed mixture as well with a dash of flour and arrowroot. Look at the consistency, and if it is not thick enough, also pulse the reserved leeks and potato cubes to add as a thickener. If you prefer a thinner soup, use the extra chucky vegetables without pulsing them. Melt in some butter if you wish, as you bring it all to a boil, and then immediately simmer for 20-40 minutes, depending on how much time you have. Don’t forget to pick out the bay leaves when serving! Happy winter soup week, xoxo.